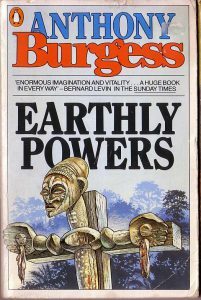 The Anthony Burgess book I recommend for World Book Night is Earthly Powers. Easily his longest novel at 650 pages, this epic exploration of evil takes in most of the horrors of the 20th century, including the First World War, the Nazi concentration camps and the religious cults of the 1970s. These events are witnessed by Kenneth Toomey, a successful playwright and novelist who is ashamed of his sexuality. His best friend is a priest, Carlo Campanati, famous for his large appetite and the efficacy of his exorcisms. The duo, who resemble Don Quixote and Sancho Panza, embark on a quest which takes them to Italy, Germany, Hong Kong, colonial Malaya, Australia and the United States. All this is narrated in the vigorous style of late-period Burgess, complete with puns, wordplay, neologisms and verbal extravagance. Strongly influenced by James Joyce and Somerset Maugham, the novel is considered by many to be Burgess’s finest achievement. He set himself the task of writing a book of Tolstoyan proportions, and he succeeds magnificently. Earthly Powers is published by Vintage in the UK and Europa Editions in the US. If you’re looking for something lighter, try The Complete Enderby (Vintage paperback), a quartet of short novels about the incident-prone poet Enderby and his complicated relationship with his Muse. First published in the 1960s, these classic Burgess comedies have lost none of their ability to dazzle and entertain. World Book Night is an annual celebration of reading and books that takes place on 23 April.